As someone who always wants to try a little bit of absolutely everything on a menu, tapas is my jam. I love going to a tapas restaurant with a few of my friends and sharing a whole bunch of dishes, and Serrano & Manchego on Leith Walk is one of my favourites. While Serrano & Manchego is great for a sophisticated gathering with friends, it’s probably not ideal for a first date – I swear every dish comes with aioli (not a complaint… just maybe have a couple mints for afters). The tapas menu has a few of the classic favourites including calamari (one of my favourite dishes to order – Serrano & Manchego’s are perfectly deep fried in not too heavy a batter), gambas al ajillo (garlic prawns) and of course chorizo al vino. Some of my favourite dishes to order are the croquetas and I always find it hard to choose between the croquettes filled with mushrooms and manchego or the cured ham and manchego (who am I kidding? I usually order both). The menu has quite a lot of fish and seafood dishes which I think is ideal for tapas, it stops you ordering too many heavy dishes. The tapas menu also has some top notch cheese dishes (obviously what I order) including a grilled goat cheese topped with raisins and Pedro Jimenez drizzle and goats cheese dumplings. 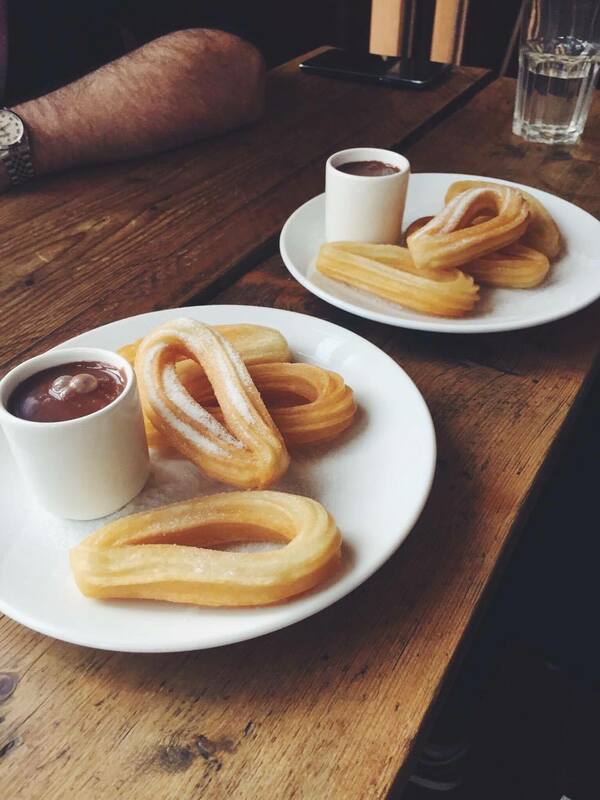 When it comes to dessert there’s only one choice really: churros. Now I normally stay as far away from these deep fried sticks of dough as possible because I have sadly been cursed with some sort of allergy or intolerance to cinnamon, and usually these are covered in the stuff. 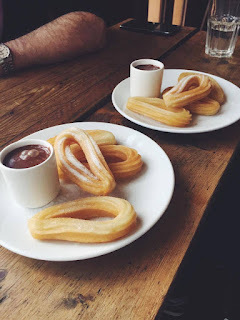 But the churros at Serrano & Manchego are the traditional Spanish way which I was told is just a sugar coating. Some churros can be all crunchy and drenched in oil, but these churros are crunchy on the outside and soft, doughy on the inside and far from being too greasy. Plus they come with a chocolate dipping sauce and who doesn’t want to dip their dessert in chocolate? Aside from churros they have a few other desserts including a Spanish cinnamon ‘French toast’ which sounds delicious (but I sadly cannot have). Serrano & Manchego is also one of my favourite places when you just fancy some nibbles and a bottle of wine. There’s a relaxed atmosphere with a great selection of Spanish wines as well as an extensive drinks menu. The menu offers a few platter choices including cheeses and charcuterie which are great alongside a glass of red. Plus with tapas, you are free to order as many or as little dishes as you want, catering to all levels of appetite. You can always order a couple plates, have a few drinks, then even order some more – the staff are always happy to come round and check if you need a top up on drink or food. This also means it can be as expensive or as cheap as you like, let’s face it when I’m there I know I’m going to be spending a lot of money and ordering far too many dishes. Check out their website for more information and to drool over their menu.